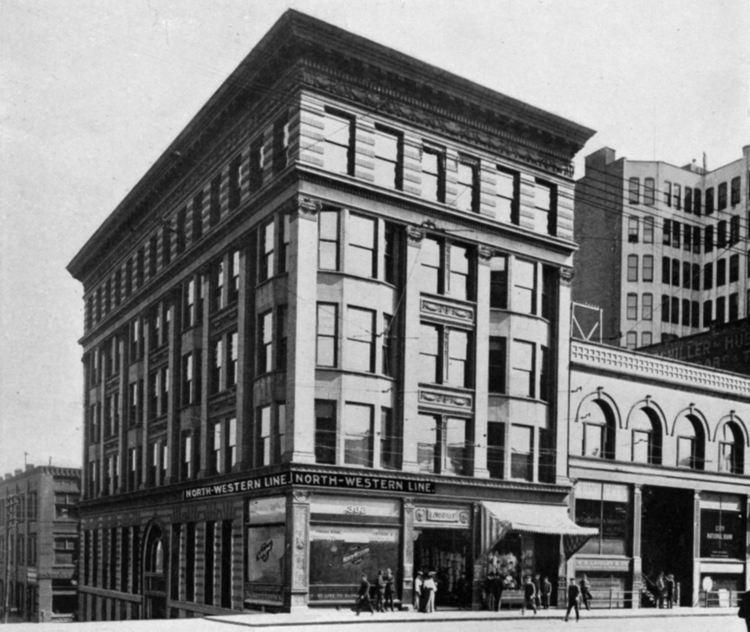 When the first Duluth Board of Trade building went up at 302–304 West Superior Street in 1885—two years before Duluth regained its city status—it stood as a symbol of the Zenith City’s grit, determination, and promising future. When it came crashing down in flames in 1894—in the midst of a national depression—it was symbolic of just how tenuous that future might be. And it left a big hole in the midst of some prime downtown real estate, a hole that would be filled with the Lonsdale Building—built not by Duluth business leaders but by eastern investors with no known connections to the Zenith City and money inherited from one of the nation’s most ardent proponents of slavery. 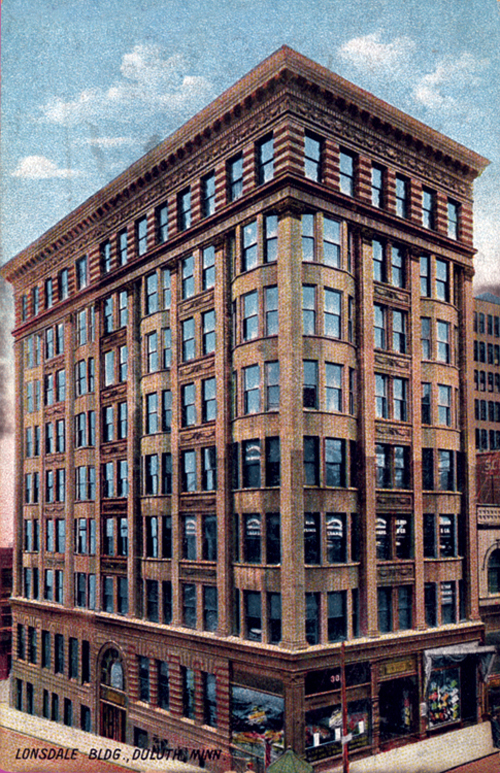 After the 1894 fire, the Board of Trade chose to build their new headquarters at 301 West First Street and put the former location up for sale. The site was purchased by Brown Real Estate of Providence, Rhode Island. At the turn of the century Brown Real Estate would become the property of newborn John Nicholas Brown II, dubbed the “richest baby in the world.” He is thought to have inherited over $4 million upon his birth February 21, 1900, estimated at more than $112 billion today (yes, billion with a “b”). A newspaper account of the property purchase stated that the Rhode Island company owned “other valuable property in Duluth and throughout the northwest.” This included the Stone-Ordean-Wells facility at South Fifth Avenue West and Railroad Street. Brown II—aka “Baby Brown”—was the direct descendant of John Brown of Providence, Rhode Island, described as “an American merchant, slave trader, and statesman.” He fought for American freedom, instigating the 1772 Gaspee Affair, yet argued aggressively against abolition—often with his brother Moses, who opposed slavery. Along with Moses and a third brother, Nicholas, John Brown I founded Brown University as the College of Rhode Island. Brown Real Estate chose to name its Duluth building after the Rhode Island village of Lonsdale, originally part of the town of Smithfield in Providence County and today part of a historic district. He hired local architects Palmer, Hall & Hunt to design his Duluth building, and Zenith City contractor George Lounsberry to construct it. At the time, Brown Real Estate couldn’t have chosen better local companies to oversee its Duluth investment. Palmer, Hall & Hunt designed Duluth’s 1892 High School (aka “Old Central”) and had become the architects of choice for the Duluth school district; the firm also designed the Duluth Normal School (aka “Old Main). Lounsberry had already constructed some of the “largest buildings Duluth had ever seen” and would later construct the unique concrete houses of Duluth’s Morgan Park, built as a company town for U. S. Steel. The first Board of Trade Building was a wood-framed structure faced with brick and brownstone, but its replacement would be much more fireproof. Like the Torrey Building just a few doors west, the Lonsdale would be made as fireproof as possible. But while the Torrey (and others) included not only steel framework but also cast iron pillars and wooden timbers wrapped in terra cotta, the Lonsdale was the first building in Duluth entirely framed with steel—600 tons of it. When first constructed in 1895, the Lonsdale was a five-story Renaissance Revival office building—four stories along Superior Street; five along Michigan Street—faced with orange brick and granite quarried in St. Cloud, Minnesota, and trimmed in terra cotta, including floral and garland panels, with an ornately detailed top floor. One of the building’s first tenants was W. M. Prindle and Company, a property management concern operated by prominent Duluthian William M. Prindle. Brown Real Estate likely became acquainted with Prindle & Co. when it purchased the site: William Prindle brokered the sale on behalf of the Board of Trade. The property went for $1,300 a foot based on its 50 feet of Superior Street real estate or $65,000 (about $1.75 million today). In 1885 the Board of Trade had paid just $10,000 for the site. The Duluth News Tribune said it was the highest price per foot anyone had paid for Duluth real estate since it first became a city in 1870. The building proved so popular that Brown Realty chose to add another three stories in 1906. Newspapers reported that the firm again hired Palmer, Hall & Hunt to design the addition, but both Palmer and Hall had moved out of Duluth by 1905. Hunt alone drew up plans for the addition, which involved raising the original top floor so that, when complete, the building looked as if it had always been eight stories high along Superior Street. When the addition was finished, Hunt moved his offices to the Lonsdale. The addition also lured attorney Herschel Fryberger, who moved his legal practice into the Lonsdale that year. The taller building attracted other law firms as well as real estate outfits and mining companies. For years the Congdon family’s offices occupied the top floor. In 1958 Northern National City Bank, whose offices were next door in the Alworth Building, purchased the Lonsdale. Prindle-Lachmund, descendant of Prindle & Co., handled the transaction. Shortly thereafter First Federal Savings & Loan took up residence in the Lonsdale. In the 1960s the exterior of the building’s first two floors were modified when grey and pink granite panels were applied to visually tie the building to the Alworth Building next door, which had undergone a similar change in the 1940s. Today’s tenants include insurance companies, attorneys, and accounting firms, anchored by the National Bank of Commerce. Herschel Fryberger’s law offices never left, and have grown into the firm of Fryberger, Buchanan, Smith & Frederick, PA. And fittingly enough, the Lonsdale also contains the offices of Onieta Realty, a direct descendant of original tenant W. M. Prindle & Co.